Joseph B. (Joe) Lyons, Jr. was an innovator whose ideas and expertise have had lasting impact on radar technology used by the United States Navy. In a 32-year civilian career in the Department of the Navy, Mr. Lyons established an outstanding reputation as an expert in radar systems, and as a leader, manager and trainer. His influence will be felt for many years to come. Mr. Lyons gained first-hand experience with radar even before his days as a University of Kentucky undergraduate. Following graduation from Dunbar High School in Lexington, he began college studies at Kentucky State College in Frankfort. Because of financial pressures, he left school after a year and joined the U. S. Air Force. By the time he enrolled in the UK College of Engineering in 1954, he had served for four years in the Air Force, where he worked as a radar and flight control systems mechanic. He was discharged as a staff sergeant. up together, and had been good friends long before they began dating. She convinced him that finishing school was the better choice. Focused on that goal, Mr. Lyons graduated in three years with a Bachelor of Science degree in electrical engineering. With the Department of the Navy, Mr. Lyons was heavily involved in the continuing evolution of radar technology in diverse areas of tactical air warfare, guidance and surveillance. He was an important part of the rich history of research and development at the Naval Air Development Center in Pennsylvania. The facility, formerly the Brewster Aircraft factory, had been acquired by the U.S. Navy near the end of the World War II. It became one of the nation’s leading Naval air research laboratories, and was later used extensively to train the original group of U.S. astronauts for the Mercury missions. aircraft carrier-based tactical early warning aircraft. In addition to his technical expertise, Mr. Lyons developed his leadership skills. He served as a branch manager, and then was named manager of the microwave technology division in the Sensors and Avionics Technology Directorate, a position he held for 28 years. 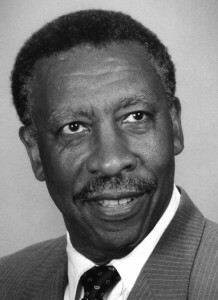 Mr. Lyons was the first African-American to hold either of those positions. Under his direction, the division grew dramatically and took a leading role in the development of Navy airborne radar and electronic warfare equipment. His successful leadership during this period of growth for the division was a source of great pride for Mr. Lyons for the rest of his life. He continued to make important contributions in technology, leading the way to several innovations. Among those were signal processing techniques for improved performance in environments with potential interference, such as clutter and electronic countermeasures used by the enemy. Mr. Lyons also helped develop techniques for improved targeting. He was the holder of six patents, three of which are still classified. Classmates at UK would not have been surprised. Mr. Lyons was proud of a first place award he had won in a student competition at UK for a device he had invented involving fluorescent tubes that would light as recorded music played. But his contributions went even beyond technology and leadership. He took on responsibilities in training and development to ensure that the department would continue to benefit from the work of highly skilled engineers. Many of those he trained moved into leadership positions. One of Mr. Lyons’ greatest memories was on the occasion of his retirement, when many of the younger engineers he had trained expressed thanks to him for both the confidence he instilled in them and the high expectations he had for them. Mr. Lyons retired from the Department of the Navy on July 4, 1984. As his commander noted at the time, his legacy not only includes engineering excellence, but also great integrity, individual initiative and a genuine concern for his colleagues and the future of the organization. Mr. Lyons died April 15, 2001. He is survived by his wife, Joan, and son, Jeffery.